This article is about the sun character from Paper Mario. For the enemy from Super Mario Bros. 3 also known as "Sun", see Angry Sun. For the enemy from Wario Land 3, see Sun (Wario Land 3). For the character resembling a sun in Mario Party 6, see Brighton. The Sun, also known as the Blessed Sun, is a celestial entity that lives in the Sun Tower at Flower Fields. The Sun is not the same sun found in the sky. It is simply a local sun that can provide extra amounts of sunlight to small regions (not entire planets). During the events of Paper Mario, Bowser's minion Huff N. Puff covers Flower Fields with a continuous stream of clouds from his Puff-Puff Machine. The continuous cloud cover prevents the Sun's rays from reaching the floral residents of Flower Fields. If this continued for too long, all the plant-life of Flower Fields would wither away and die from lack of sunlight, allowing Huff N. Puff and his forces to rule the region unopposed. Mario and his allies, with the help from their new comrade Lakilester, destroyed the Puff-Puff Machine. With the clouds gone, the Sun can return to the sky and restore Flower Fields. Additionally, with sunlight returned to the area, Mario can grow a magic beanstalk to take him to Cloudy Climb to fight Huff N. Puff and free the imprisoned Star Spirit Klevar. 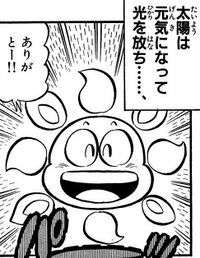 In volume 26 of Super Mario-Kun, the Sun is first shown to be sick. After Mario and his partners, including Lakilester, destroy the Puff-Puff Machine, the sun is revived and helps them grow a beanstalk that takes them to Huff N. Puff. "It's the sun. Some people call it the "Blessed Sun." It's the source of life for flowers and trees. If it doesn't come out, eventually all plants will wither away. Sunshine makes me happy, too." This page was last edited on September 24, 2018, at 16:36.